The writing isn't quite on the wall for traditional cable and satellite television - not so long as companies like Comcast can manipulate the market with artificial monopolies and data caps, anyway - but things are definitely looking up for cord-cutters. The latest fruit of the union between American telecom AT&T and satellite TV giant DirecTV is a series of TV packages that don't require, well, TV packages. These data-only streaming options will become available some time in the fourth quarter of 2016, according to an AT&T press release. The third tier is a freebie service, DirecTV Preview, which will offer an ad-supported showcase of DirecTV content. AT&T isn't saying which channels will be available on which tiers of service, probably because they don't even know yet - this sort of thing will need to be negotiated on a network-by-network basis. There's also no mention of price, but given DirecTV's premium position in the marketplace, I'm guessing that "cheap" isn't on the table. DALLAS, March 1, 2016 /PRNewswire/ -- Later this year AT&T1 plans to launch the ability for you to access and stream DIRECTVvideo services over a wired or wireless Internet connection from any provider and from virtually any device – smartphone, tablet, Smart TV, streaming media hardware or PC. Our 3 new affordable video offers will be designed for customers looking for premium content with choice and flexibility in what they want to watch and how they want to watch it. We plan for each service to come with a set number of simultaneous sessions. Also, these services will not require annual contracts, satellite dishes or set-top boxes. The company plans to offer a range of content packages, including much of what is available from DIRECTV today -- on-demand and live programming from many networks, plus premium add-on options. Customers will be able to access the service over a wired or wireless Internet connection and on Internet-enabled devices. Consumers can simply sign-up for the service, download the app and begin watching. This affordable offer will deliver a mobile-first user experience for people wanting to watch premium video and made-for-digital content directly on a smartphone, regardless of the wireless provider. Consumers can start watching video immediately after the same simple sign-up and app-download process. This free offer for anyone with a wired or wireless Internet connection will feature some of the quality programming available on DIRECTV today. The tailored ad-supported service will showcase content from AT&T's AUDIENCE Network, many networks and other content sources, and millennial-focused video from Otter Media, a joint venture of AT&T and The Chernin Group. "These new video subscription models reflect the flexible content choices, viewing options and simple, transparent pricing that consumers want. AT&T intends to be the first company to deliver that flexibility, along with an effortless customer experience," saidJohn Stankey, CEO - AT&T Entertainment Group. "These offers will provide a broad range of customers with greater freedom and choice to watch, binge and even buy premium content, regardless of how and where they enjoy their entertainment. "We are looking at these offerings differently than others in the market. We often hear from customers who want more content from streaming services, or who can't get or can't afford a traditional pay-TV service," Stankey said. "We intend to offer customers a quality pay-TV experience, including top channels, sports and more, with increased value and flexibility of pure online streaming and no need for home installation." AT&T is a leader in video streamed over the Internet. We serve more than 60 million streams and downloads to our TV customers each month. Today more than 60 percent of our network traffic is video. AT&T will continue to provide DIRECTV's premium satellite TV entertainment service, which includes its industry-leading lineup of live and on-demand programming choices and optional add-ons such as HBO, Showtime and its exclusive NFL Sunday Ticket Package. Customers will be able to access their programming on virtually all mobile devices, as they have been able to do for many years. 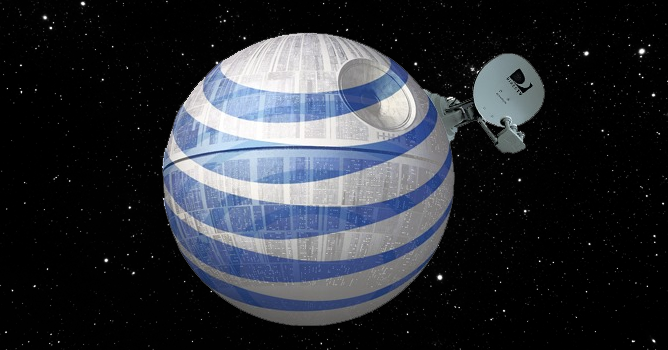 AT&T also will continue to offer its U-verse TV and Internet service.